A greater hurdle while dealing with differentially expressed transcripts in novel organisms is the Gene Ontology (GO) enrichment analysis and their visual interpretation. To date there are several open-source applications available to extract GO terms corresponding to protein/nucleotide sequences (A detailed list can be accessed here, However, the best I have experienced for the De novo transcripts is InterProScan), and to perform enrichment analysis (A detailed list is here). Most of these enrichment tools work like a charm for model organisms, but only handful of them support the incorporation of custom annotations. 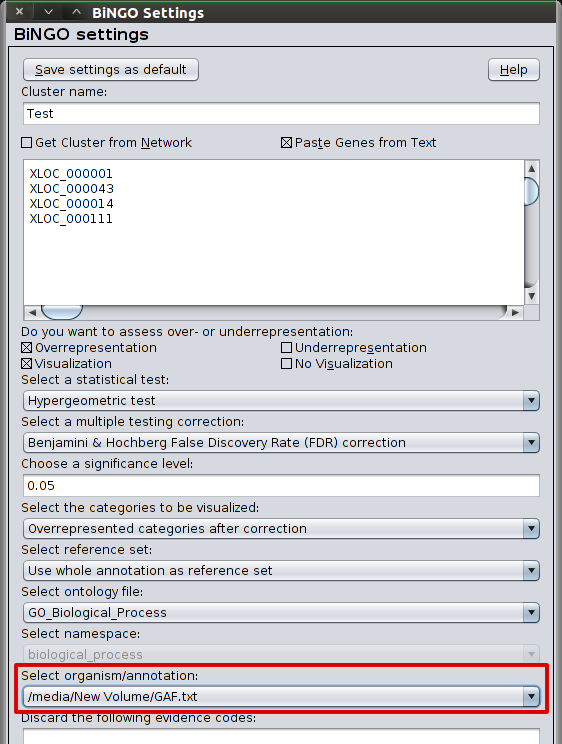 One such tool is BiNGO (Biological Networks Gene Ontology tool), an open-source Java plug-in of Cytoscape. BiNGO can be used either on a list of genes, or interactively on subgraphs of biological networks visualized in Cytoscape. BiNGO maps the predominant functional themes of the tested gene set on the GO hierarchy. In order to use BiNGO for novel organisms, one need to provide a custom annotation file (CAF). In principle, CAF contains the gene/transcript and GO relationship, with one relationship per line, eg. The left value is the transcript name and right value is the GO category (without the prefix, ‘GO:’) obtained using InterProScan or synonymous tool. Additionally, one can also choose to switch to a newer ontology (obo) file downloaded from geneontology.org download page. After providing gene list of interest and choosing the appropriate options, hit the “Start BiNGO” button to start the analysis. Cytoscape together with BiNGO offers several downstream network grooming options, which you may find useful. For more on this, visit BiNGO and Cytoscape user guides. Hope this helps in your endeavor.